It's nice to see a book dedicated to comics colouring, a subject that other comics instructional books often have only a chapter about. The software recommended is Photoshop - the book uses version CS3. You'll get the most out of the book by using the same software. Some of the files and scripts on the CD-ROM provided can only be used by Photoshop. Also, the instructions are geared towards Photoshop, such as the menu commands. This is a very practical book with lots of step-by-step lessons, and homework assignments. The lessons starts from the basics like scanning, to filling colours, to adding special effects. Some of the tips and techniques mentioned are major time-savers. The Photoshop scripts and actions are particularly useful, and you can use them for your own work. There are some mistakes in the instructions but most are simple enough to figure out. I was stuck at Lesson 4 and emailed the author Brian Miller who replied later. Turned out I didn't prepare the file using the process taught earlier. All lessons towards the back build on what you have learned. Process matters. One should pay special attention to the chapter on colour separation and trapping. I work for a newspaper and printing mishaps like colour plates misalignment happen often. It's important to understand colour trapping. This book is highly recommended to beginner and intermediate comic artists. 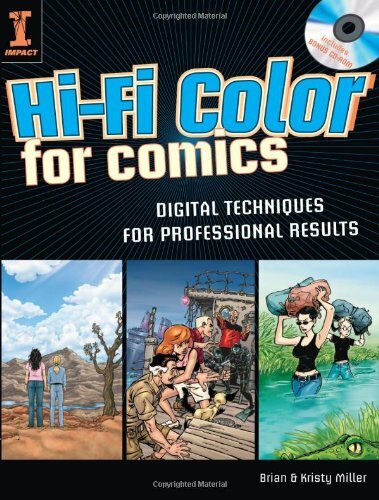 The companion website for the book is www.hificolorforcomics.com.